Edo State tribunal affirms Obaseki as elected governor as Ize-Iyamu, PDP kick – Royal Times of Nigeria. 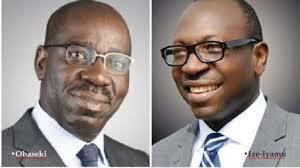 The Edo State governorship tribunal has affirmed Godwin Obaseki as the elected governor of Edo State. 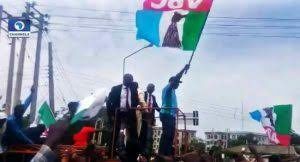 The candidate of the Peoples Democratic Party, PDP, Osagie Ize Iyamu had filed a petition challenging the declaration of Godwin Obaseki as winner of the September 26, 2016 election. Delivering the judgment, Justice Ahmed Badamasi-led three member tribunal, dismissed the petition filed by the PDP and its candidate as lacking in merit. Badamasi held that the petitioners failed in all fronts to prove the allegations as pleaded in their petitions. The tribunal added that Ize Iyamu and the PDP’s ”heavy reliance” on the voting process, especially accreditation and ticking of voters is misplaced and has made the strength of their case immaterial. It also held that while the petitioners abandoned some of their pleadings, “witnesses evidences were controverted under cross examination’’. Ize Iyamu, who was absent at the sitting has however rejected the ruling, vowing not only to appeal the judgment but also pursue his case up to the Supreme Court.